I’ll admit, I’m firmly planted on team SUV. I have three kids and have owned a few 3-row SUVs, and couldn’t be happier with them. I’ve heard time and again though, “If you just drove a minivan, you’d change your mind.” Having driven one for weeks at a time – multiple times – when traveling, I have to say… my mind is unchanged. 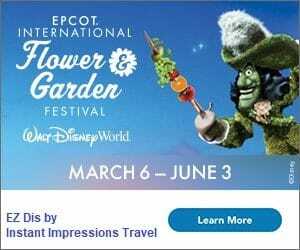 That said, we recently got to try out a 2017 Toyota Sienna while in Walt Disney World for a little over a week. There are a handful of things I enjoyed; if you’re in the market for a van, I think you’ll want to know about them, too! 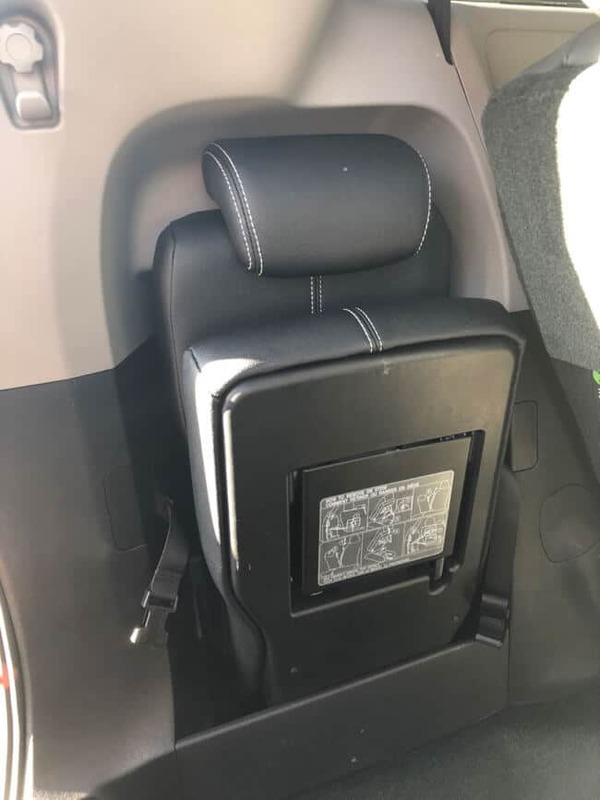 An extra seat stowed in the trunk connects right between the captains chairs in the middle of the van to create, effectively, a middle bench seat. In many vans I’ve seen, the only option is to have one or more of the children really, really far away in the back of the vehicle. 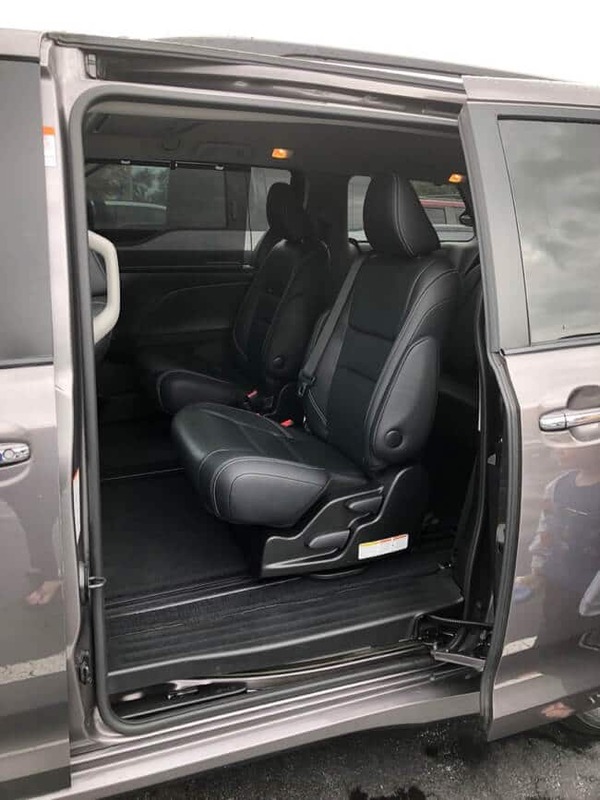 In the Sienna, we were pleased to find a seat that can be put up in the middle of the captains chairs, adding an additional seat or bringing 3 kids up closer to the driver and passenger seats. That was a super cool surprise! The moonroof on this van was massive, and we all really enjoyed it. Having come from Ohio to Florida in late fall, it was wonderful that we could all experience a bit of the Florida sunshine while driving. The one time that I purchased a vehicle without a sunroof or moonroof, I instantly regretted it. Every vehicle I’ve had since has had one, and I’d definitely love one this size in my next car! One of the things I dislike about many minivans is that the third row of seating cuts dramatically into storage space in the vehicle. Stow away type seats have made major hauling a little easier in minivans than it was when they were first popular, but only with quite a bit of finagling. It’s super nice to have a moderate amount of space without having to almost literally disassemble the vehicle. The Sienna’s trunk was deep enough to hold plenty, and the rear seats folded easily to create even more room. 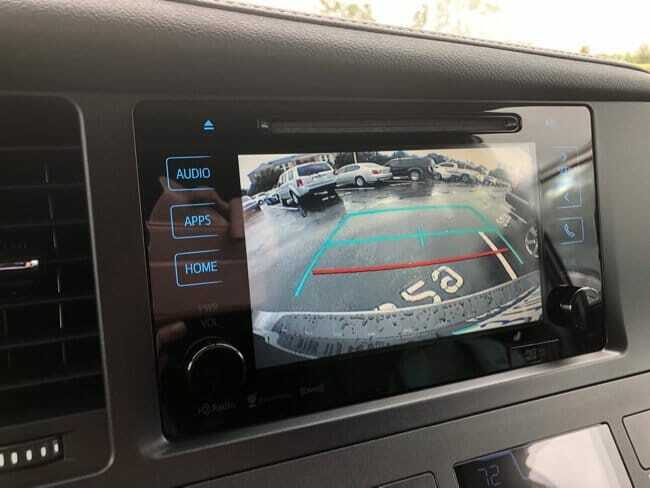 Rear backup cameras are only one part of the safety package offered in the Toyota Sienna. 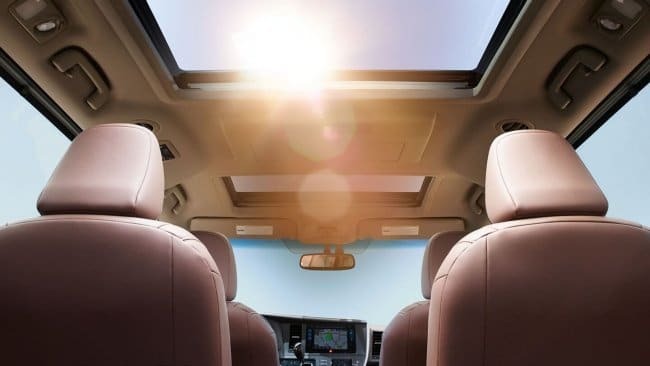 Most new cars have made super impressive technological advances as far as safety is concerned, and the Toyota Sienna is no exception. The model we drove had blind-spot monitoring, parking assist sensors, a backup camera, and pre-collision sensors – along with all of the airbags, carseat safety systems, etc that you would expect in a current vehicle. And unlike some, the alarms and messages seemed to be easily viewable but not more distracting than they needed to be. The Infotainment display on the 2017 Toyota Sienna had everything right at your fingertips. 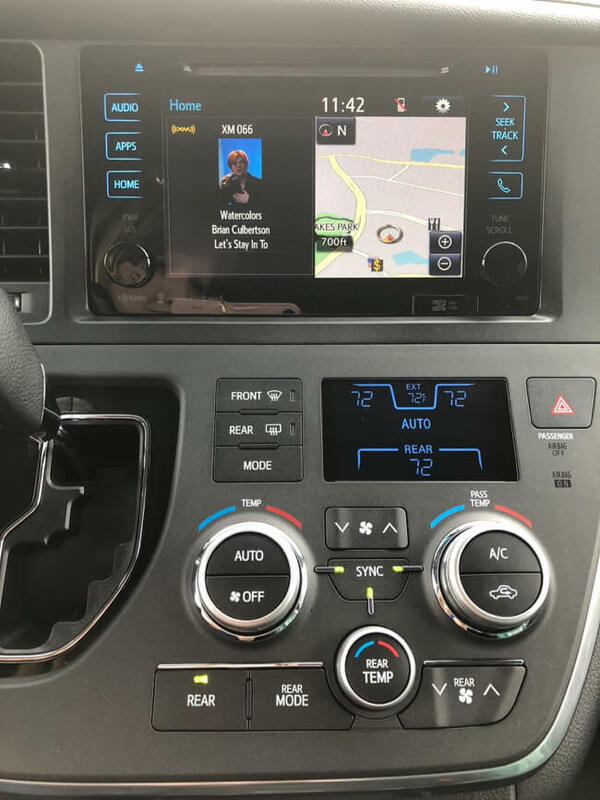 Like other new vehicles we’ve driven, the Toyota Sienna has easy bluetooth connectivity, as well as options or plugging in USB devices to access entertainment. Our model also had a large, wide-screen BluRay player; I’ll admit, I don’t really understand this. The aspect ratio was so bizarre, so in most cases I think you’d just end up utilizing the middle third or so of the screen. Perhaps in some cases this would be useful though, and it was definitely unique! 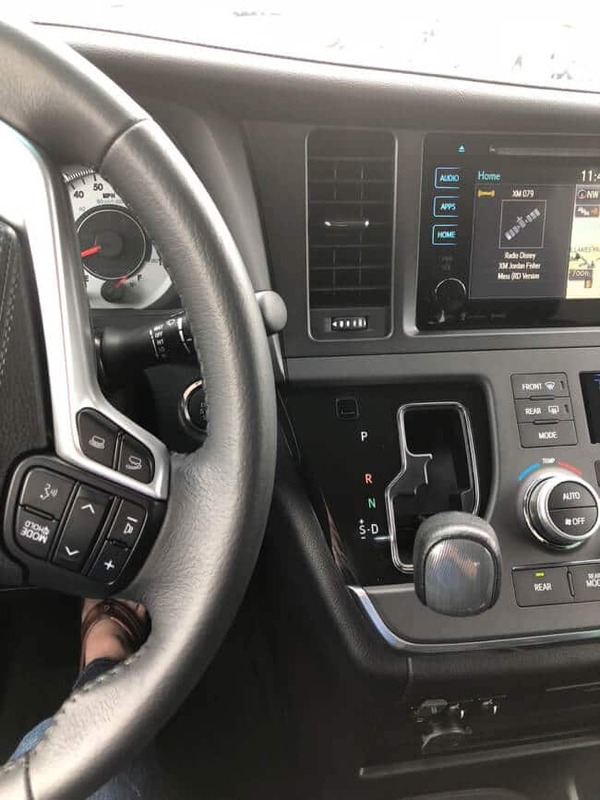 It took the whole week to (almost) get used to the gear shift being here… but that’s not the reason I wouldn’t buy the van, and it’s definitely not a deal breaker if you’re shopping for one! 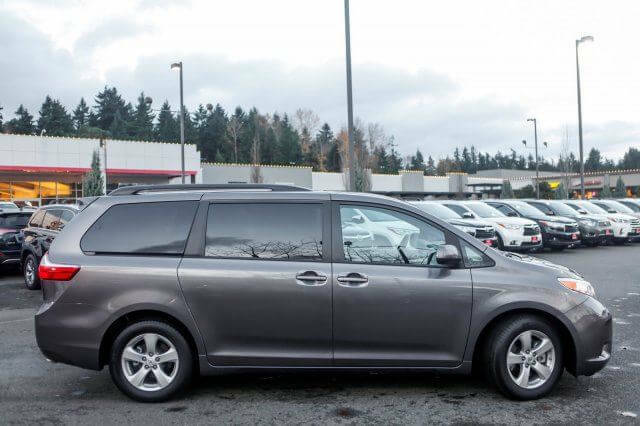 When I looked at the Sienna site, Toyota called this a “Swagger Wagon”. I know some people have used that term lovingly about their own vans, but it just makes me chuckle. While I’m not the target audience for this vehicle, it was a pleasure to drive. If you’re in the market for a van, I can’t imagine why this one wouldn’t top the list to test drive!